In his first novel since the acclaimed and award-winning Swanny's Ways, Steve Katz takes another look at the failure of Humanism in the West, through the lens of the great Sicilian master, Antonello da Messina. A father and son, who have never met, both set out on quests for meaning in their lives. The father is obsessed with Antonello, and convinced he can find what he thinks is a lost painting of St. Francis. He gets lost on the way, and disappears. The son becomes obsessed with finding out what happened to the father, and his discoveries are more than he can absorb. This is a double picaresque that takes turns through fantasy, sexual follies, and wild historical and philosophical speculations. The frail positionings of order in art are played against the background contemporary chaos. After being trapped into impregnating his lesbian artist girlfriend, Solomon, a New York Jewish art historian, heads to Sicily to track down a lost masterpiece of St. Francis of Assisi by Antonello da Messina. Thirty-seven years later, in the summer of 2001, Nathan, the son he never knew, begins a similar quest, less interested in the artwork using it only as a means to retrace his father's footsteps. What transpires is a double picaresque written with occasional flair and a not insignificant degree of humour whose denouement offers the tired and testing 'more than they bargined for'. Imagine if you will that Dan Brown sets himself the challenge of an A.S. Byatt novel but that he cannot wrest himself from his art sleuth oeuvre. Throw in some Marquezian magic realism and Humanist theory and there you have it. The real issue with this book is the epilogue, PSSST! Katz indulges in an extended essay on 9/11 and its cataclysmic effects on the American psyche. Indeed Nathan is so perturbed after his atypically heroic rescue efforts during the 9/11 attacks that he moves to Colorado forthwith. Essentially Katz argues that 9/11 represents the ultimate manifestation of the failure of Humanism, tacitly justifying the lurch to jingoistic and xenophobic insularity in the States since 2001. In so doing he employs the most crass sentimentalism, referring to New York as, 'the greatest experiment in pluralism ever known to the world', and the perpetrators of 9/11 as, 'those self-righteous maniacs who would see only the one narrow path to the dogma they call truth'. 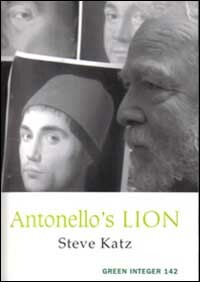 Ultimately Antenello's Lion fails to 'not easily leave the mind', as Katz wishes, leaving only an intaglio of a good yarn marred by the author's fetishism. "...the great Prefontaine cyberglobe, endless modes available with the touch of a remote stylus, so it could feature cities and roads, both day and nightscape...a projection of the distribution of world religions;...the migrations of tribes, so you could watch the armies of Saracens, Visigoths, Mongols sweep through." In this sense, there is no better description of the experience of reading Antonello's Lion than the metaphor Katz himself offers here. Thick with the fervent confusion of human identity and the conundrumy brew of our created world, the novel offers many rewards—especially for readers willing to wade on the shore a moment, letting the waves tickle their feet, before its undertow pulls them in.